Advertising media planning and billing settings of campaigns can override or extend. In the advertising media settings need to do is find a tab "Planning / settlement" with appropriate settings. If the advertising media "Use Planning" property is activated, a maximum volume (current) day volume and absolute daily volume for views and clicks can be set for this advertising medium. The settings correspond to those of campaigns. 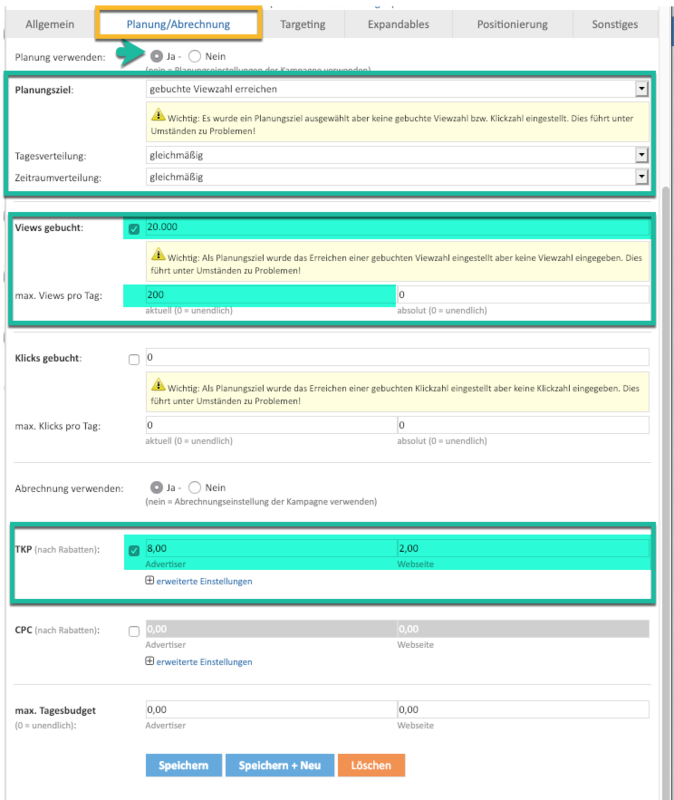 If these settings are enabled, they are together with your campaign settings: The ad server checks upon delivery if the campaign goal and advertising goal are not exceeded and only then delivers. If one of the objectives to be achieved, the campaign or the ad will not be delivered. Note: If the advertising period does not match the campaign period, the amount of time the campaign period and advertising period is taken to calculate the daily targets equivalent. If the advertising media "Use billing" property enabled a different pricing and daily budget can be saved for this advertising medium. If the settings are enabled, replace them billing preferences of the campaign: The price of a display or a click is then calculated using the options of the advertisement and not using the options of the campaign. If the settings are enabled, the maximum daily budget applies in addition to the campaign settings: The ad server delivers the ad only when both daily budget of the campaign and the advertising material are not exceeded.